A dental crown is a type of dental restoration which caps a tooth or a dental implant. Crowns are usually used when a large cavity threatens the health of a tooth. 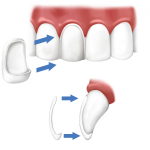 A bridge is used to replace a missing tooth by joining permanently to adjacent teeth or dental implants. Different types of bridges are used, depending on the way they are fabricated, as well as the way it is anchored to the neighboring teeth. Dental crowns and bridges can be made from various materials, including (but not limited to) all metal (such as gold or another alloy), porcelain-fused-to-metal, all resin, all ceramic, or Zirconia. A dental veneer is a thin layer of restorative material bonded over a tooth surface, either to improve the aesthetics of a tooth, or to protect a damaged tooth surface. Dental veneers can be made from porcelain or from resin composite materials. To apply a veneer, a very small amount of the original tooth enamel may need to be removed to create room for the veneer to fit. A denture is a removable replacement for missing teeth and surrounding tissues, it is usually made of acrylic or a combination of acrylic and metal . Crowns, composite resin bonding, porcelain veneers or even orthodontics can be used to improve the aesthetics and oral functions of a patient. At CODEN Specialists, we will access your oral health before recommending suitable dental treatments for your consideration.